ABT-737 is a BH3 mimetic inhibitor of Bcl-xL, Bcl-2 and Bcl-w with EC50 of 78.7 nM, 30.3 nM and 197.8 nM in cell-free assays, respectively; no inhibition observed against Mcl-1, Bcl-B or Bfl-1. Phase 2. Cardiomyocytes transduced with or without Ad-Mst1 were treated with ABT-737 (0, 0.1, 1, 10 uM) for 12 hours. Representative immunoblots with antibodies to p62/SQSTM1, LC3 and GAPDH are shown. Nat Med 2013 19(11), 1478-88. ABT-737 purchased from Selleck. Release of mitochondrial cytochrome c and loss of mitochondrial membrane potential after exposure to ABT-737 (100nM) for 2 hours were assessed by immunohistochemistry and staining with TMRE (red, top panels) and anti-CD41/FITC (green, top panels). Bar represents 5 um. Note that control cells display spreading on glass slides, whereas ABT-737-treated cells do not. Blood 2011 17(26), 7145-54. ABT-737 purchased from Selleck. Platelets were incubated in HBS with or without ABT-737 (100nM) for 2 hours before analysis by immunohistochemistry and confocal microscopy. Actin was stained using phalloidin/Alexa-488 (green), and tubulin was stained using anti-tubulin/phycoerythrin (red). Bar represents 5 uM. BCL-XL mediates human neutrophil survival. PMNs were preincubated with the BH3 mimetic ABT-737 (1–10 μM), then cultured in normoxia (gray bars) with or without GM-CSF (500 U/ml) or hypoxia (white bars)or 20 hours, and apoptosis was assessed by morphology (n = 4). J Clin Invest 2011 121, 1053-1063. ABT-737 purchased from Selleck. Analysis of SW480 and SW620 cell sensitivity to the BH3-mimetic ABT-737. (a, b) Percentage of apoptosis in adherent or suspended SW480 (a) or SW620 (b) cells cultured in the presence (ABT-737) or absence (ctrl) of ABT-737 (1 uM). Cell Death Dis 2013 4, e801. ABT-737 purchased from Selleck. (B) The sensitivity (LD50) of CLL cells, assessed by annexin V staining after 48 h of treatment with ABT‐737, ABT‐263 or ABT‐199, was plotted against the pBcl‐2/Bcl‐2, Mcl‐1/Bcl‐2 and (pBcl‐2 + Mcl‐1)/Bcl‐2 ratios. Relative protein quantification was carried out with kodak carestream molecular imaging software and normalized to β‐actin. Spearman's correlation (r) and P values are shown. Data shown are representative of five independent experiments. Br J Pharmacol, 2016, 173(3):471-83. ABT-737 purchased from Selleck. Bcl-XL/Bcl-2 inhibitor ABT-737 aggravates the proapoptotic effects of IL-1IFN-. INS-1E cells were transfected with single or smart Pool PUMA siRNAs and exposed to ABT-737 for 24 h. At this time point, cell death was measured by HO/PI, n 3. *, p 0.05; **, p 0.01. J Biol Chem 2010 285, 19919-19920. ABT-737 purchased from Selleck. Effect of ABT-737 on the cell viability of CCRF-CEM cells by treatments of AY4 (10 μg/ml), TRAIL (0.5 μg/ml), SAHA (1 μM),VPA (1 mM), or ABT-737 (10 μM) alone or in combination for 24 h prior to MTT assay. Apoptosis 2010 15, 1256-1269. ABT-737 purchased from Selleck. Effects of ABT-737 and RES, applied alone and in combination, on the viability of MOLT-4 cells. Toxicol In Vitro, 2017, 42:38-46. ABT-737 purchased from Selleck. Upper panel ABT-737 inhibits TFK-1 and EGI-1 cell growth.Cells were exposed to ABT-737 at a concentration ranging from 1 to 50 lM. Following 72 h of incubation, growth inhibition was analyzed by crystal violet assay. Dose–effect plot of ABT-737 treatment is presented. Cancer Chemoth Pharm 2011 67, 557-567. ABT-737 purchased from Selleck. Lower panel detection of PARP-1, cleaved caspase-9 and caspase-3, BCL-2 and MCL-1 in TFK-1 and EGI-1 cells after 72 h of ABT-737 treatment (1, 3, 10, 25,50 μM). Cell lysates were analyzed on Western blotting. 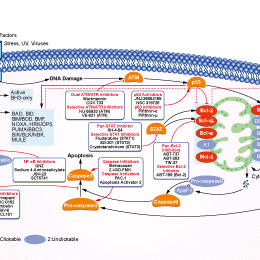 GSIXII synergized with ABT-737 to trigger apoptosis in breast cancer cells . Breast cancer cell lines were incubate d for 48 hours with 10μM GSIXII or DMSO (Ct) in combination or not with ABT-737, 1 μM. Then apoptosis was evaluated with Apo2.7 or Annexin-V staining and flow-cytometry analysis. Represented data are the means of positive cells ± SEM, from three independent experiments. (A) Suboptimal concentrations of GSIXII (5 μM) and 1 μM ABT-737 were used alone or in combination in MFU assay in MCF7 and BT549 cell lines. Results were obtained from three independent experiments and compared with mock-treated condition. (B) The 20 μM SAHM1 was used alone or in combination in MFU assay in MCF7 and BT549 cell lines. Results were obtained from three independent experiments and compared with the mock-treated condition. Biochem Biophys Res Commun 2013 408, 344-9. ABT-737 purchased from Selleck. Apoptosis induced by BCL2-inhibitors in P-glycoprotein expressing cells. MDCKII wild type or MDR1 cells were exposed to different concentrations of ABT-737 (C) or ABT-263 (D) for 24 h before apoptosis was assessed by flow cytometry using externalization of phosphatidylserine. Biochem Biophys Res Commun 2012 408, 344-9. ABT-737 purchased from Selleck. 3 μM ABT737 inhibited growth and viability of TF-1 cells and potentiated proapoptotic effects of 1 μM BIO after 72 hours treatment. TF-1 cells treated with both drugs exhibited more apoptotic cells compared to those treated with each single drug. ABT737 abrogated the protection from BIO-induced apoptosis provided by MS5 coculture. Exp Hematol 2010 38, 908-921. ABT-737 purchased from Selleck. Arch Oral Biol, 2017, 73:1-6. ABT-737 purchased from Selleck. Dr. Arnim Weber of Medizinische Mikrobiologie und Hygiene Universitatsklinikum Freiburg. ABT-737 purchased from Selleck. MDB-MA-231 cells were exposed to 30 um cisplatin in the absence or in thepresence of 100nm ABT-737.The cell were stained with Hoechst 33342,MitoTracker Red and Yo-pro-1. Dr. Zhang of Tianjin Medical University. ABT-737 purchased from Selleck. First-generation inhibitor of anti-apoptotic Bcl-2 proteins. Binding affinity of GST-Bcl-2 family proteins to the FITC-conjugated BH3 domain of Bim (FITC-Ahx-DMRPEIWIAQELRRIGDEFNAYYAR) is determined. Briefly, 100 nM of GST-Bcl-2 family fusion proteins are incubated with serial dilutions of ABT-737 in PBS for 2 min. Then, 20 nM of FITC-Bim BH3 peptide (FITC-Ahx-DMRPEIWIAQELRRIGDEFNAYYAR) is added. Fluorescence polarization is measured using an Analyst TM AD Assay Detection System after 10 min using the 96-well black plate. Then IC50 are determined. SCLC cells are treated for 48 hours in 96-well tissue culture plates in a total volume of 100 μL tissue culture medium supplemented with 10% human serum. Viable cells are determined using the MTS assay. Konopleva M, et al. Cancer Cell, 2006, 10(5), 375-388.
 van Delft MF,et al. Cancer Cell, 2006, 10(5), 389-399. Del Gaizo Moore V, et al. J Clin Invest, 2007, 117(1), 112-121. Tahir SK, et al. Cancer Res, 2007, 67(3), 1176-1183. Ishitsuka K, et al. Cancer Lett, 2012, 317(2), 218-225. Konopleva M, et al. Cancer Res, 2008, 68(9), 3413-3420. Wade M, et al. Cell Cycle, 2008, 7(13), 1973-1982. Paoluzzi L, et al. Blood, 2008, 112(7), 2906-2916. Li R, et al. Mol Pharmacol, 2009, 75(5), 1231-1239. What’s the recommended method about reconstitution of the compound for in vivo animal study? For oral administration, we suggest the vehicle: 30% Propylene glycol, 5% Tween 80, 65% D5W, at up to 30mg/ml; For injection, ABT-737 can be dissolved in 2% DMSO/50% PEG 300/5% Tween 80/ddH2O at 2.5 mg/ml. ABT-199 (GDC-0199) : Bcl-2-selective, Ki<0.01 nM. ABT-263 (Navitoclax) : Bcl-xL, Ki≤ 0.5 nM; Bcl-2, Ki≤ 1 nM; Bcl-w, Ki≤ 1 nM. Obatoclax Mesylate (GX15-070) : Phase II for leukemia, lymphoma, myelofibrosis, and mastocytosis. BAM7 : Direct and selective activator of proapoptotic Bax with EC50 of 3.3 μM. A-1210477 is a potent and selective MCL-1 inhibitor with Ki and IC50 of 0.454 nM and 26.2 nM, respectively, >100-fold selectivity over other Bcl-2 family members. Navitoclax (ABT-263) is a potent inhibitor of Bcl-xL, Bcl-2 and Bcl-w with Ki of ≤ 0.5 nM, ≤1 nM and ≤1 nM in cell-free assays, but binds more weakly to Mcl-1 and A1. Phase 2. Venetoclax (ABT-199, GDC-0199) is a Bcl-2-selective inhibitor with Ki of <0.01 nM in cell-free assays, >4800-fold more selective versus Bcl-xL and Bcl-w, and no activity to Mcl-1. Phase 3. Features:Re-engineered version of ABT-263 (Navitoclax). UMI-77 is a selective Mcl-1 inhibitor with Ki of 490 nM, showing selectivity over other members of Bcl-2 family. Obatoclax Mesylate (GX15-070) is an antagonist of Bcl-2 with Ki of 0.22 μM in a cell-free assay, can assist in overcoming MCL-1 mediated resistance to apoptosis. Phase 3. Features:Potential 1st-in-class small molecule antagonist of Bcl-2 designed to inhibit all relevant Bcl-2 family members, including Mcl-1. TW-37 is a novel nonpeptide inhibitor to recombinant Bcl-2, Bcl-xL and Mcl-1 with Ki of 0.29 μM, 1.11 μM and 0.26 μM in cell-free assays, respectively. 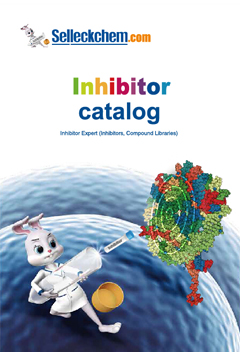 Sabutoclax(BI-97C1) is a pan-Bcl-2 inhibitor, including Bcl-xL, Bcl-2, Mcl-1 and Bfl-1 with IC50 of 0.31 μM, 0.32 μM, 0.20 μM and 0.62 μM, respectively. AT101, the R-(-) enantiomer of Gossypol acetic acid, binds with Bcl-2, Bcl-xL and Mcl-1 with Ki of 0.32 μM, 0.48 μM and 0.18 μM in cell-free assays; does not inhibit BIR3 domain and BID. Phase 2.